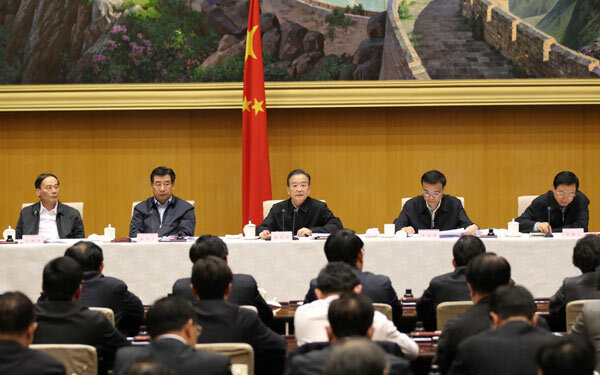 Premier Wen Jiabao on Wednesday vowed to realize the country's green goal to cut energy intensity by 20 percent between 2006 and 2010, amid the strong economic recovery. In a nationwide video and teleconference, Wen told governments at all levels to work with an "iron hand" to eliminate inefficient enterprises. To that effect, he laid out new targets to shut down the outdated 10 GW capacity of small thermal power plants, 25 million tons of iron smelting, 6 million tons of steel production, 50 million tons of cement, 330,000 tons of aluminum, 6 million containers of glass sheets and 530,000 tons of paper production within this year. The new targets should be distributed to local governments and enterprises by the end of this month. All the enterprises should also be closed down by the end of the third quarter. Local officials and executives of enterprises will be taken to task if their specific energy-efficiency targets are not met by the end of the year. Over the past four years, the use of energy per unit of GDP has fallen by 14.38 percent, but this is still far short of the national goal of a 20 percent drop during the five years ending in 2010, the State Council said in a statement. "Since the third quarter of last year, high energy consuming and high emission industries have grown rapidly, and some closed production facilities have resumed operations," the statement said. During the first quarter of 2010, the country's energy intensity increased by 3.2 percent year on year, as a result of the rapid growth in the six energy intensive sectors: thermal power, iron and steel, nonferrous metal, building materials, petrochemical and chemical industries, according to the State Council. A total of 83.3 billion yuan ($12.2 billion) from the central government will be directed to energy efficiency and pollution treatment projects by the end of this year, it said. The statement also said China will promote ecological compensation - a market-based mechanism to balance economic development with nature conservation - and draft regulations in the sector. According to the mechanism, regions and industries that benefit from the exploitation of natural resources should pay for the damage they cause to the environment and ecosystem, said Ge Chazhong, an expert on environment economics with the China Academy of Environmental Planning. "The regulations are expected to work out a clear set of methodologies for ecological compensation to answer the question of who should pay how much for what," Ge said. The country started to initiate a series of ecological compensations in different regions and industries in 2007. Government payment for nature conservation zones is the most common practice of ecological compensation in China. These regions are reimbursed for the economic development they have foregone in making way for the zones. There are 265 national-level nature conservation zones, according to the Ministry of Environmental Protection. In some areas, mining companies are charged "ecological compensation fees" to support nature conservation and pollution treatment. For instance, the Shanxi municipal government started to levy fees on coal miners for each ton of coal they have exploited since 2007, which was then put into a "sustainable development fund." By the end of May last year, the fund had pooled a total of 34.8 billion yuan, of which 11.3 billion yuan was spent on environmental protection projects such as cleaning up the waterways of the Fen River and ecological restoration along the drainage areas. Pilot projects on ecological compensation among different sections of certain rivers have also proven to be successful in some provinces, such as Zhejiang and Jiangsu, Ge said. "An upper stream section would pay compensation for a downstream section if the water quality at a point was below the national standard, or vice versa," Ge said.